Dak Prescott is the undisputed starting quarterback for the Dallas Cowboys, but with the No. 1 seed locked up, it seems like a smart idea to get Tony Romo some action in the final two games of the season. That’s something the Cowboys have discussed, per Jason Cole of Bleacher Report, but he reports it’s “very unlikely” Romo will make an appearance Monday night or in Week 17. This echoes comments made by team owner Jerry Jones recently, who said he didn’t want to risk Romo getting injured. While the team may not be willing to let Romo play for fear he’ll get injured again, there is an argument to be made for him to get some snaps in before the playoffs. Romo hasn’t taken a regular-season snap all year long. He was injured in the preseason, necessitating Prescott’s early baptism by fire, and has never made it onto the playing field since. The Cowboys have been raving about how sharp he is on the practice field, but there is no substitute for game action. It’s understandable that Dallas doesn’t want to lose Romo to injury again, but getting him some snaps is something the franchise really should try to make happen. He’s at risk of injury every time he steps onto the field, just like every other player who lines up on every play. But throwing him into a playoff game cold, should Prescott be injured, is not an ideal scenario. But that’s just one man’s opinion. It’s going to be interesting to see if Romo can convince his coaches and owner to let him play on Monday night or in the final weekend of action. As the Denver Broncos await what essentially amounts to an exhibition game to close the season at home against the Oakland Raiders, they have plenty of time to evaluate their roster and coaching staff prior to the NFL version of Black Monday. Two key positions and areas of focus right now for this team are obviously at the head coach and quarterback position, where the Broncos have some serious question marks. Is Gary Kubiak still the right head coach for this team? What happened to ‘kicking and screaming’ or ‘iron sharpens iron’? Is Kubiak healthy enough to maintain a head coaching position in the NFL? What about the young quarterbacks? What did the front office or coaching staff see from Trevor Siemian that makes them think he can help the Broncos win a Super Bowl as early as next season? Where is Paxton Lynch’s development? Will the Broncos’ offensive woes be solved by one of those two guys? Could Tony Romo be part of the answer for the Broncos? When I first heard the Romo/Broncos rumors, I had a good laugh. Romo’s contract with the Cowboys right now is ridiculous, and the Broncos just got out of having to pay a quarterback huge money. In fact, part of the reason why Peyton Manning retiring was such a relief was the fact that the Broncos would now be able to afford the core pieces of their star-studded defense. With Romo’s cap number such a hinderance to a potential trade, it seems laughable that the Broncos would even consider, but I think this ‘rumor’ has been given a violent shove to the center of the table for the Broncos, and for good reason. This team needs a veteran quarterback, at least right now. We’ve seen enough from Trevor Siemian and Paxton Lynch — regardless of the play of the offensive line — to know that neither guy is capable of consistently making the required plays to put the Broncos even into the playoffs with this good of a defense behind them. Of course, there are more concerns about Romo beyond his large contract. He is obviously injury prone and an aging veteran in this league. He hasn’t played at all this year with the emergence of Dak Prescott in Dallas, and his future is about as uncertain as anyone in this league, but there’s certainly a place for him. The Broncos could use his veteran poise and leadership, and asking a veteran quarterback to take a pay reduction wouldn’t be a first for John Elway and the front office. If you’ll recall, the Broncos asked the great Peyton Manning to take a pay cut. They brought Colin Kaepernick into town and asked him to take a significant pay cut. Manning took one, and I wonder if he regrets it. If I were Jerry Jones and the Cowboys, I know that Tony Romo would be allowed to treat his impending team switch as a free agent. 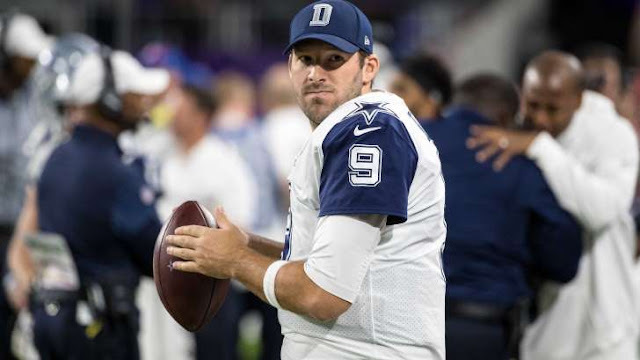 Though he is under control of the Cowboys contractually, it wouldn’t surprise me in the least if Jones allowed Romo to put together a short list of teams he would like to play for, and that the Cowboys might accommodate. There have already been reports that Romo is eyeing the Broncos in 2016, and if that’s the case, then these two teams could easily work something out in terms of trade compensation, as the Broncos did with the 49ers last year. The biggest question would be whether or not Romo was willing to let his wallet take a significant hit just to play for a team that could contend for a title. Romo has never won a Super Bowl. He’s never even played in the big game. As a former undrafted free agent, Romo is one of the best quarterbacks in the league since he’s been in it but he hasn’t been able to stay consistently healthy. When he is healthy, the Cowboys have been great. This is the first season his absence hasn’t been a complete detriment to that team. In an ideal world, the Broncos would be able to get Romo to take a smaller base salary that is incentivized, similar to what Russell Okung did this season for them. It would allow them a key veteran at a position of need and at a reduced price, allowing for other needs to be filled. Because, you know, Romo’s not going to want to get destroyed behind this offensive line. Having a quarterback that understands pre-snap reads like Tony Romo, someone who knows how to adapt and adjust to defenses as the game goes on…it would be invaluable to this Broncos team. Not to mention, the defense might finally have someone they could be confident about again. Perhaps it was just the way I personally viewed the game, but against Kansas City, it looked like the Broncos’ defense was just done trying to pick up the slack for the offense. They didn’t give up, but they looked a bit resigned to their fate, allowing over 300 yards of offense by Kansas City in the first half. Adding Tony Romo is far from any sort of certainty from the Broncos, but with Siemian and Lynch behind him, it would be a situation that John Elway has to have firmly at the top of his list of things to consider. 0 Response to "Report: ‘Very unlikely’ Tony Romo plays in final two games"